We see it all in this illumination: the past, the present, and the future. The page is being ripped apart in front of us, and what does it reveal? We see most prominently, a raven. 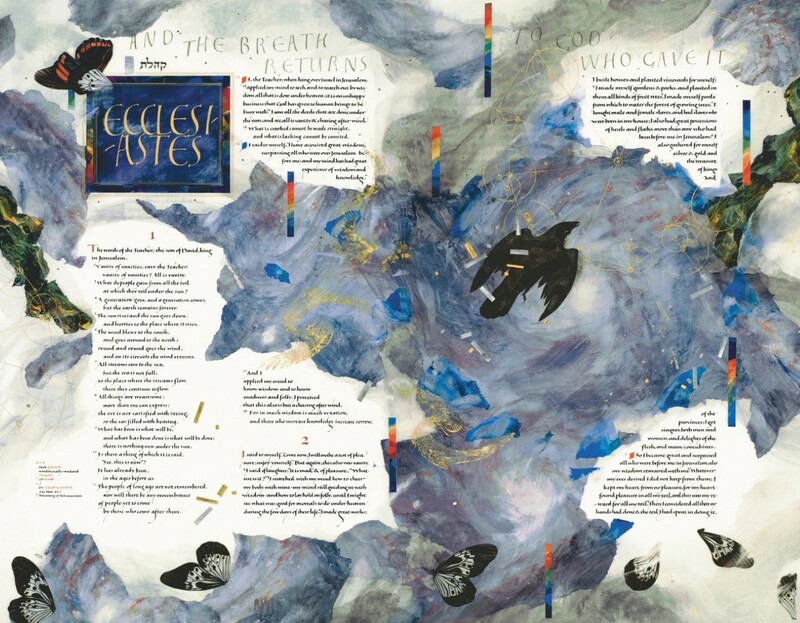 The same raven that has flown across the Creation illumination is here in the Ecclesiastes Frontispiece. On the left and right-hand sides we see the images of creation from as seen from the Hubble telescope. The butterfly wings remind us of Jacob’s Ladder from Genesis. The seraph wings connect us to the Prophets. The bars of rainbow colors bring us all the way up to Revelation. We see so much here, we might begin to think we know the whole story. But that is exactly what the scripture passage warns us of. “I said to myself, ‘I have acquired great wisdom, surpassing all who were over Jerusalem before me; and my mind has had great experience of wisdom and knowledge.’ And I applied my mind to know wisdom and to know madness and folly. I perceived that this also is but a chasing after wind. For in much wisdom is much vexation, and those who increase knowledge increase sorrow” (1:16-18). The author of Ecclesiastes is not saying that wisdom is a bad thing. On the contrary, wisdom brings light into the darkness. However, we are reminded that life is a fleeting moment, and that death negates any kind of lasting profit (Ceresko, Introduction to Old Testament Wisdom). I know that for myself, as is true for many others, I often struggle with humility. Sometimes my desire to be right about something can overshadow something very important that another person has to offer. In a week, I will have completed a Master of Divinity. Certainly that knowledge and the experiences I’ve had in the now seven years that I have studied theology do give me some prestige, do they not? In reality, this knowledge does not bring me any closer to that which I most desire in the depths of my being: to be united with God. Wisdom is not about gaining theological knowledge, or knowing all of the “best practices” in responding to people in tough pastoral situations. Of course those things will be useful tools to me as I enter ministry, but again, I do not believe that is what will bring me closer to God. Wisdom only brings us from darkness into light when we open ourselves to the wisdom of all things. This illumination shows us the past, the present, and the future not to know those things but to know ourselves in those things. To move into the light we must open our hearts and listen to that wisdom of all the ages and humble ourselves in the realization that we are but a fleeting moment of it all. © Donald Jackson, 2002 The Saint John’s Bible, Order of Saint benedict, Collegeville, Minnesota. Scripture quotations are from the New Revised Standard Version of the Bible, Catholic Edition, © 1993, 1989 National Council of the Churches of Christ in the United States of America. Used by permission. All rights reserved. This entry was posted in Easter Reflection 2014, General and tagged Ecclesiastes Frontispiece by Seeing the Word Team. Bookmark the permalink.